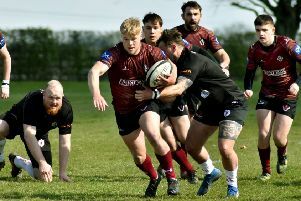 Late additions and the loan of two players from Burbage helped Melton RFC Third XV put out a full XV at Aylestone Athletic on Saturday. Determined to build on previous performances and put another win on the board, Melton faced recently bolstered opponents and this showed from the off. Melton kicked off and thanks to some strong tackling looked to be dominant in the Aylestone 22, but this was short-lived as Athletic regained possession and ran the length of the pitch to score, despite heroic tackling from Wright and Jakes. The visitors hit back, with new prop Matt bulldozing his way through tackles to make valuable ground, but Athletic soon converted again despite covering play from Cunningham. Heads remained high as Melton’s pack responded, using the phases in the forwards pack, with Buxton and Smith quickly recycling the ball to edge them closer to the line. Thorpe and Keightley asserted themselves in rucks and crash play, and after a couple of near-misses, Wright finally got over to put Melton on the scoreboard. The visitors couldn’t add to their tally before the break despite more strong running from Miller. Melton came back after half-time ready to turn the game around, taking advantage of sloppy play to open up their back line with long runs by Bowles and Kerr. Chapman joined the forwards, making an impact in the rucks, while team stalwart Chirico returned to the field, with excellent lineout defence helping to put Melton on the front foot. Good running and support from Wardough edged Melton closer, and when Kerr broke from a ruck, his pop pass put Bowles over the line for some much-needed points. Tanner and White remained strong in both defence and attack, but it was looking less and less likely Melton’s day as Athletic added to their lead. Swann’s efforts in defence were admirable, putting in try-saving tackles on the wing to limit the damage, and in the dying minutes Kerr broke from a scrum and crashed through for the final points of a 66-19 defeat. Melton showed good spirit and ability to bounce back, right up to the final whistle on a difficult day against a side able to field their strongest XV for the first time this season. Melton’s First, Second and Third XVs are all at home to Lutterworth on Saturday.